I’ve experimented with dozens of tools and tricks to stay productive. Some work great and others… not so much. Here are nine game-changing tools I use to stay productive. There are two types of lunatics in this world: those who keep their inbox clean and those who always have 12,000 emails. Whatever camp you’re in, the other camp is insane. I’m on team “clean inbox” because I use my inbox as a to-do list. I typically have between 3-10 emails in my inbox any given time. If an email is in my inbox, it means I have to action it. If I keep seeing the same email for a week or two, I know I’m slacking. Archive it. This removes the email from my inbox and, more importantly, my focus. I can always search for the email if I ever need to find it again. I use FollowUpThen for emails that I know I’ll eventually need to action but just not right now. Simply put, it’s a service that allows you to schedule an email reminder. There are a bunch of similar services that all essentially do the same thing but FollowUpThen works best for me. I’m still on their free version (up to 100 monthly reminders) and they allow you to link multiple email addresses to the same account (which I use for my personal and work email accounts). It’s pretty simple to use. 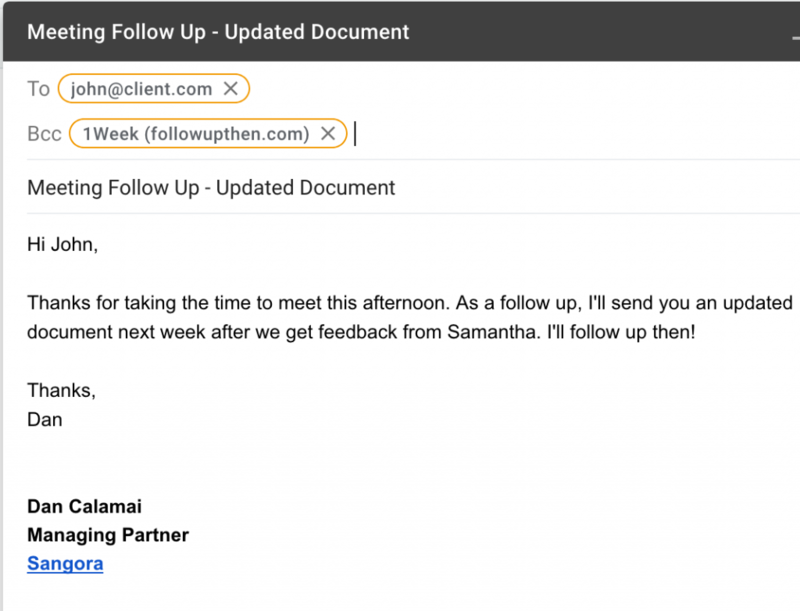 Just include [date or time]@followupthen.com in the To, CC, or bcc fields, and the email will reappear in your inbox at that time. This email will come back to me, and only me, in one week. It’s a nudge to remind me to send the document to John. If I get an email invite with an RSVP deadline in two weeks, I forward the email to 2weeks@followupthen.com. The email comes back to my inbox in 2 weeks so I remember to RSVP. And the biggest game changer of them all? Lots of work related emails require follow ups at a certain time. Whenever I need to follow up in 3 days or next Monday, I just bcc 3days@followupthen.com or monday@followupthen.com and I know I won’t forget. This one is huge. It helps keep my projects on track and keeps my team and clients accountable. Since the follow up is in the bcc, the people on the email don’t see your little trick. You’d be surprised how often this little trick impresses people. They think you have magical powers simply because you follow up when you say you will. G Suite (formerly Google Apps) have really stepped their game up the past few years. When Google Docs and Sheets first came out in 2006, their usefulness was very limited. Word and Excel were still light years ahead of them. That’s all changed over the past few years. I can’t point to a specific feature that’s put them over the hump…it’s just an overall level of product completeness. These Google Apps meet 95% of my document editing needs. I pay $5 per month for G Suite, which gets me an email address for my business domain (sangora.co), 30 gb of storage, and access to all the G Suite products (e.g. Docs, Sheets, Slides Drawings). If you run a small business, it’s 100% worth it to pay 5 bucks monthly just for the custom email domain. When you’re talking to prospects and clients, it is much more professional to communicate from yourname@yourcompany.com as opposed to yourname+yourcompany@gmail.com. You’ll look like a legitimate business and not just someone pretending to run a business. When I started my own business in 2015, I quickly realized I needed a better way to manage my business relationships and opportunities. I struggled for a year using Gmail contacts, but their features are geared towards personal email communication. What I needed was a lightweight CRM (customer relationship management) system to keep all of my contacts and potential deals in one place. Salesforce is the CRM industry standard but it’s a bit pricey and overly complex for small businesses. After some research on affordable and lightweight options, I landed on Insightly. I’m on the free version which gives you up to 2 users and 2,500 records. I’ve been using it for over 2 years and I’m still only at 32% of my max record count. It’s nothing fancy but it lets me track my potential deals and contact information for business related contacts. Exactly what I need. 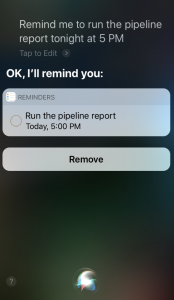 Activate Siri and tell her “remind me to email Jeff next Tuesday” or “remind me to run the pipeline report tonight at 5pm” or “remind me to buy some eggs tomorrow”. That will create reminder in your phone and a notification pops up to keep you on track. I’m not a big fan of paper and I like to keep my workspace clean. So when paper comes into my life (e.g. 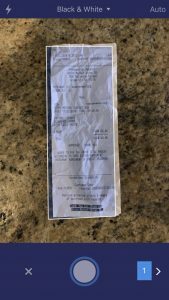 bills, receipts, whiteboard drawings) I open up the Scanner Pro app and convert it digitally. Taking a picture with your phone’s’ camera will work too, but Scanner Pro is a cleaner experience. 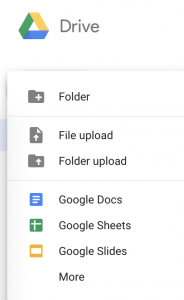 It automatically uploads to Google Drive or Dropbox. I have a Google Drive folder to store all my receipts and Scanner Pro auto uploads to that folder. No more lost files. The scanning process finds the edges of the document and shrinks the PDF size to match the size of the doc. This isn’t perfect but works about 80% of the time. The end result is a cleaner document scan without a weird background of your desk or floor. Fancy Hands is a service that gives you access to a team of remote, United States based, virtual assistants. Just draft up a note with your request details and send it to request@fhands.com (or use their app) and a US based virtual assistant will start working on the task. I pay $30 / month which gets me up to 5 tasks per month and unused tasks carry over into the next month. Yes, you can definitely find some cheaper options with virtual assistants based overseas. I find it valuable that Fancy Hands’ assistants are all US based for when I need them to make phone calls on my behalf. Admittedly, I’ve thought about cancelling this service several times…but I’ve held onto it for a couple years. Why? Because when you really need it, it’s totally game changing. The image below is a screenshot of my live dashboard, showing tasks used and time saved. When traveling to new places, I’ll have them find local gyms that allow drop-ins and rank them by price and proximity to where I’m staying. In general, it’s really nice to have the option to unload mental stress to someone else without feeling bad about it. 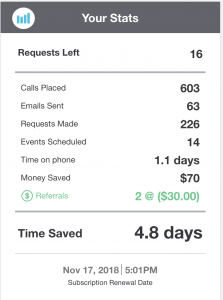 Over 1 day of phone time saved. Huge! HelloSign is a G Suite plugin that lets you convert a Google Doc into a PDF and gather digital signatures. This is a must have when gathering signatures from a client on a new proposal. It adds a level of professionalism and removes friction from the signature process. I create the document, open up the HelloSign add-on, and process the document for signature. HelloSign will send the document to all parties, collect their signature, and email the finalized copies when all signatures are received. Gather signatures from others or just sign yourself. 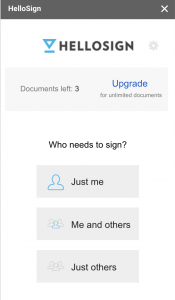 HelloSign is also useful for when only you need to sign an official document. I’ve had to do this a bunch on NDA’s, leases, and government forms. The process is the same, but instead of sending to other people for signature you can just sign the document yourself. This is a life saver because you no longer need to print out the doc, sign with a pen, and then rescan to send back. HelloSign gives you up to three free processed documents per month and I rarely need to process more than two documents a month. I’ve been using Asana to manage complex projects since 2013. It’s a simple tool that keeps everything organized and on-track, without a million emails flying around. It’s similar to other popular project tools like Trello and Basecamp that keep your projects on track. 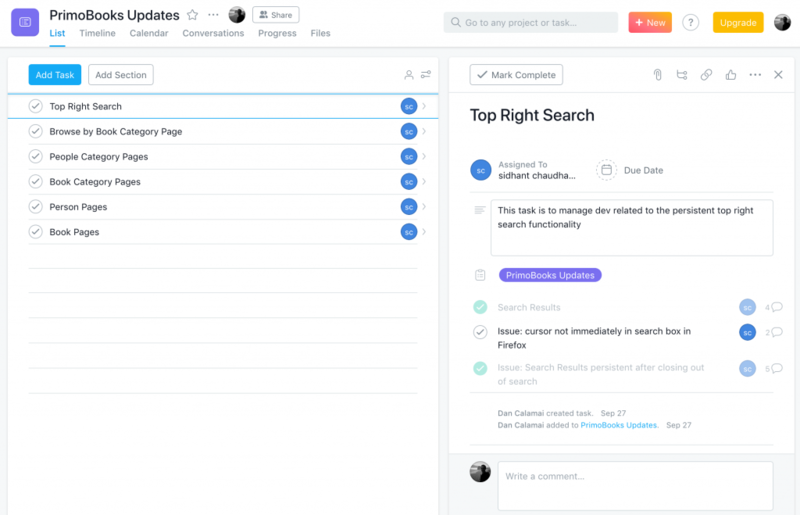 Asana is intentionally simple and open-ended, which lets it satisfy a number of use cases while still remaining easy-to-use. I most recently used Asana to build a book recommendation website, PrimoBooks. I created high level tasks that corresponded to sections of the stie (e.g. general design, homepage, book page) and sub tasks that tied to specific requirements. Each sub task had a description of the requirement, screenshots, owner, and due date. As tasks were completed by the site developer, they could be assigned back to me for review and I could make comments that formed a thread for centralized communication. If you’re every struggling to keep work projects on track, give Asana a shot. They’re pretty generous with their free version (up to 15 team members) so I’ve never had to pay a dime for such a useful tool. What tools and tricks do you use to stay productive? Wow, I am really impressed with your creative use of Fancy hands. It is often so hard to isolate and automate mundane tasks that require human interaction. Even though I love productivity hacking, I usually just fail to recognize opportunities like this. Glad you found it helpful DB! Great tips, thank you! I’m also fan of “clean inbox” for the same reasons, and looks like FollowUpThen could be very useful. Yea, give it a try. I’ve been on the free version of FollowUpThen for a year or two and it’s been a lifesaver. Great hearing from you Alex! We have a ‘strategic’ plan. It’s called doing things.